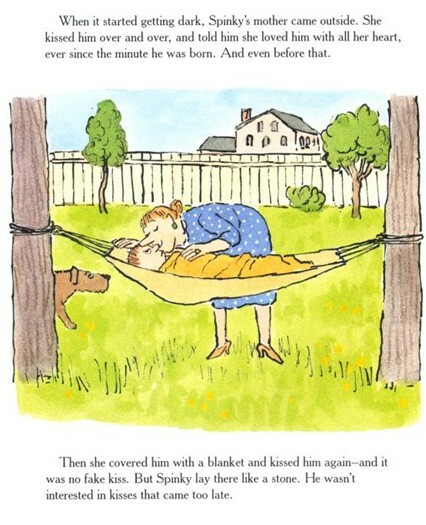 Spinky is convinced that his family hates him and goes off to sulk in his hammock. His brother and sister try to make amends. His mom even brings him a beautiful tray of food. But nothing can get Spinky to stop sulking―not even a circus passing by on his street! Will Spinky ever cheer up? 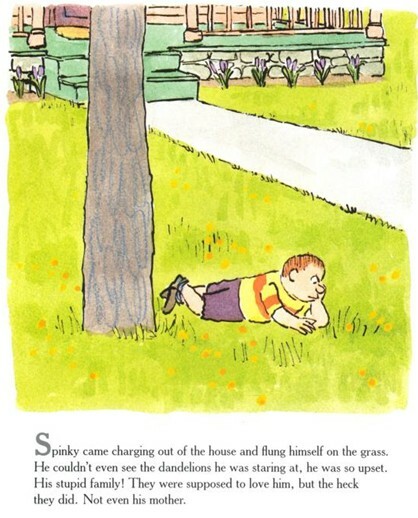 Spinky Sulks is another delightful tale from the incomparable William Steig that will leave readers of all ages smiling. 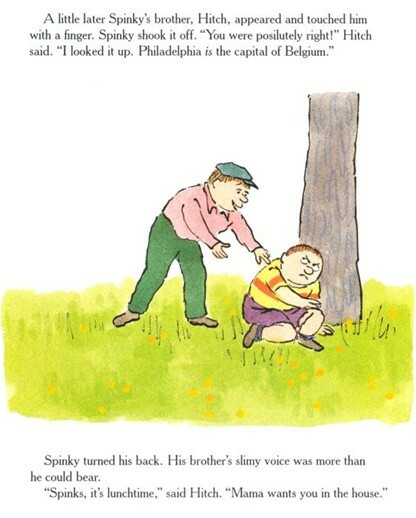 Spinky Sulks is a 1988 New York Times Book Review Notable Children's Book of the Year and Outstanding Book of the Year. Spinky joins a distinguished list of Steig heroes: plucky Pearl, stalwart Abel, brave Irene, playful Solomon. But Spinky doesn't behave very heroically; in fact, he's a colossal brat. He's sullen and unforgiving, testing the patience of his very loving family at every turn. Storming out of his house, feeling angry and unappreciated, Spinky heads into the yard for a good sulk, and nothing can entice him out of itnot apologies from brother Hitch (with his "slimy voice"), daisies from sister Willamina, visits from buddies Smudge and Iggie, a box of candy, a delicious tray of lunch, a circus parade, a prancing clown bearing ice cream. Finally, Spinky figures out how to stop sulking in a way that allows him to save face. "After that, Spinky's family was much more careful about his feelings. Too bad they couldn't keep it up forever." Spinky is a strongly drawn character, endearing despite his obstinacy. And the message of the book will be clear to young readers, as capsulized by Spinky's father: "Even though Spinky was wrong to sulk like a baby, every one still loved him anyway." It's a story with terrific child appeal, and Steig's characteristic dry humor makes it a pleasure for adults as well. Michael di Capua Books. I was surprised to see the reviews here that were critical of this book, because of Spinky's attitude. Spinky is not supposed to be a role model. His is an example of how NOT to behave. This message wasn't too subtle for my seven year old son to pick up on. It's a shame that a couple of adults here had it fly over their heads. 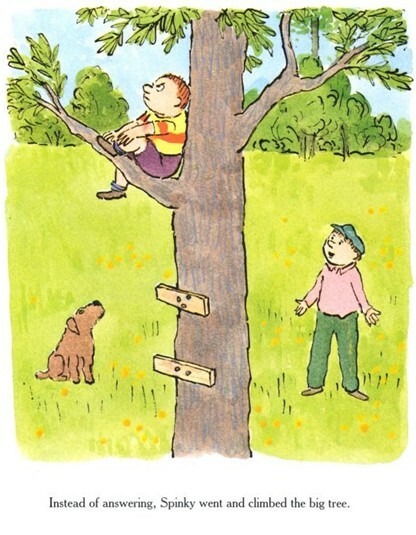 I believe that William Steig has created a wonderful story that accurately depicts how children act, and that willfulness, stubborness, and self-centeredness need to be overcome. 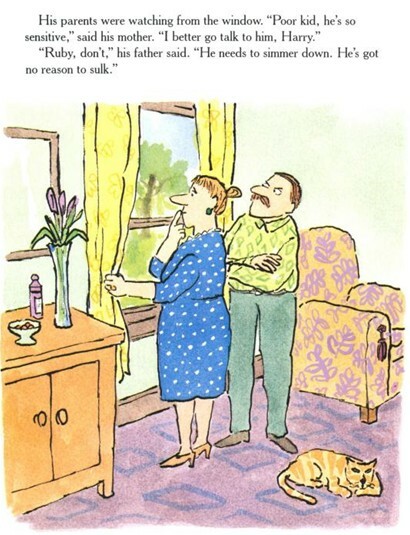 The pictures are also some of the funniest that I've ever seen in a children's picture book, or anywhere else for that matter.